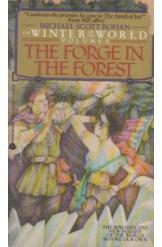 The Forge In the Forest by Michael Roha,n Sci Fi. Book is in good condition, all pages intact. The magical pre-glacial world is at war, with the Steerers of the World heading one faction and the wizards of Smithcraft the other. Book 2 of "The Winter of the World" series.